Mix all pizzelle ingredients in a large bowl. Place about tablespoon-sized pieces of dough onto your pizzelle maker and press in batches. Each machine is different, so see manufacturer instructions for further help with this step. Work quickly to form into a cone shape as they come off the press. You only have a few seconds or the pizzelle will begin to flake and crack. Repeat until you run out of dough. To make the mousse, start with the 1/2 cup of cream and place it into a pot with the mint. Bring to a light simmer and kill the heat. Allow to sit and steep for at least 30 minutes. Remove the mint, making sure to press it against the side of the pot to squeeze out any additional liquid and mint flavor. In a large bowl, warm the chocolate, butter, and sugar either in the microwave or by placing the bowl on top of the steeping mint. The chocolate does not need to be fully melted at this point. Once the mint is out of the cream mixture, bring it back to a near simmer and yet again remove from the heat. Whisk in the gelatin and stir well to combine. Pour the minted cream over the warm chocolate and stir well to combine, making sure the chocolate is fully melted at this point. Whisk the remaining cream to form whipped cream. In 3 batches, add the cream to the (now cooled to about room temperature) chocolate mixture. Gently mix it, folding lightly with a spatula. 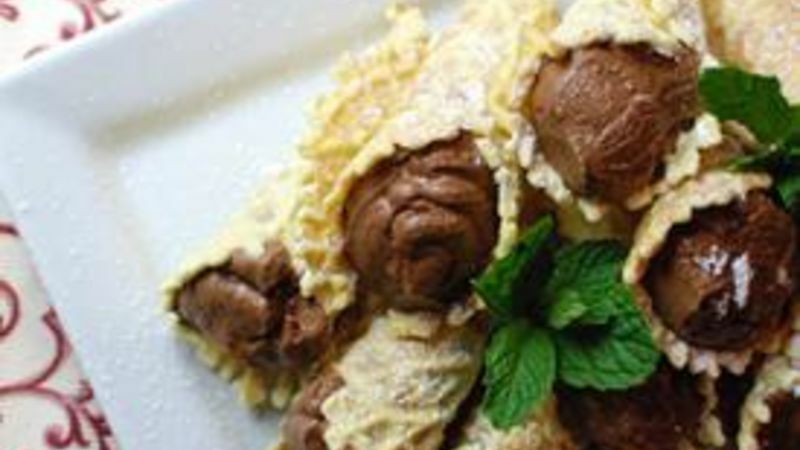 Place the mousse into a piping bag and pipe into the pizzelle cones. Place in the fridge for an hour to set before serving. Top with some powdered sugar and garnish with mint leaves. I have wanted to make some sort of cone-shaped Christmas cookie with a filling for years. When it comes time to do it each year, I end up making an excuse about being too busy. The attention to detail that cookies like this require just seemed like way too much work for me. This year I finally forced myself to try making some and I found out that it actually wasn't very tough at all! The pizzelle dough (my Italian grandmother’s recipe) was as easy as mixing a few ingredients in a bowl. The mousse involved steeping some mint and whipping some cream. In the end, not only were these MintChocolateConeCookies easier than expected, they were super impressive and delicious. It forms a sticky batter that was drier than I expected. Just a small amount to make each cookie. About a tablespoon. They only take about a minute and a half to cook. Now you have to work fast! These cookies harden quickly. Fold them into a cone shape immediately as they come off the press. A helper is nice for this step but not necessary. Put them on a plate seam down so they can finish hardening. At this moment, I knew this recipe was going to turn out awesome. Now on to the filling! Place a few branches of mint in cream and bring to a simmer. Kill the heat and let it sit about a half hour. When you pull out the mint, give it a good press against the side of the pan to make sure to get as much liquid from it as possible. Heat the cream back up and whisk in gelatin. Pour it over some already warmed chocolate and butter. The hot cream should melt it the rest of the way. Slowly incorporate whipped cream into your chocolate mixture, folding it lightly so as not to lose any of the air. Then just pipe it into your cones. Pop these guys into the fridge so the gelatin can set. They taste best after an hour in the fridge, but were still great three days later. I can’t confirm how much longer they will last cause we ate them all by the third day! Dan Whalen is planning on making this recipe every Christmas from now on. He has been blogging for almost 4 years at The Food in my Beard; check Dan's Tablespoon profile often to try his recipes with creative international spins!